Mahuta Tāwhiao, of Ngāti Mahuta, was born in 1854 or 1855 at Whatiwhatihoe, Waikato. He was the oldest son of Tāwhiao, the second Māori King. He grew up during the wars of the 1860s and the isolation which followed. As a result he received no European education and spoke little English. He became King on the death of his father in 1894. By that time the King Movement had declined, and was largely limited to the Tainui tribes in Waikato and Ngāti Maniapoto in the King Country. The desperate position of his people led King Mahuta to seek compensation for the land confiscations of the 1860s. 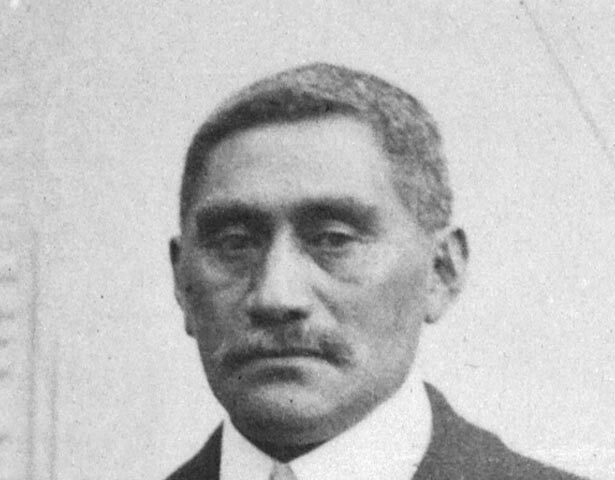 Prime Minister R. J. Seddon was eager to end Tainui isolation and gain King Mahuta's support in opening up the King Country for European settlement. He suggested that the King take a seat on the Legislative Council. Seddon also took steps to give the King Movement some self-government, and compensation for the confiscations. These latter proposals were later watered down and dropped. In 1903 Mahuta accepted Seddon's offer of a seat on the Legislative Council, although some of his people opposed this. He temporarily passed on the Kingship to his younger brother, Te Wherowhero Tāwhiao. Mahuta soon became disillusioned with his limited role in the Council and the Liberals' Māori land policies. There was little progress in settling the confiscation claim. He took no active part in debates after 1907, although he attended sessions until his term ended in 1910, when he took up the Kingship again. He died in 1912. King Mahuta's term on the Legislative Council was a brief and unsuccessful experiment in Kīngitanga cooperation with European authority. Ko Whatiwhatihoe i Waikato te wāhi i whānau ai a Mahuta Tāwhiao i te tau 1854, 1855 rānei. Ko Ngāti Mahuta tōna iwi. Ko ia te mātāmua o ngā tamariki a Tāwhiao, te Kīngi Māori tuarua. Ka pakeke ia i ngā riri o te tekau tau atu i 1860 me te wā o muri mai i te wā o te noho tūhāhā o tōna iwi. Koiraka rā te take kāore ia i kuraina ki te mātauranga me te reo Pākehā. Ka ara a ia hei Kīngi i te matenga o tōna matua i te tau 1894. I taua wā kua tūpuhi te Kīngitanga, kua whāiti ki ngā iwi o Tainui tae atu ki a Ngāti Maniapoto. Nā te tino mate o tana iwi, ka rapu paremata a Mahuta mō ngā whenua i raupatutia i te tekau tau atu i 1860. Hīkaka katoa te Pirimia a Te Hētana (R. J. Seddon) ki tēnei, nā tōna hiahia mā Mahuta a ia e āwhina ki te whakamutu i te noho wehe o ngā iwi o Tainui, ki te huaki i te Rohe Pōtae hei whakanoho i ngā tāngata whai. I kōrero a Te Hētana ki a Mahuta mō tētahi tūru kei te noho wātea mōna i te Kaunihera Ture. Ka kōrerohia te tuku atu i tētahi wāhanga kāwanatanga ki te Kīngitanga me tētahi paremata mō ngā whenua raupatu. Tāria te wā ka waimeha, ka whakatahangia ēnei kaupapa. I te tau 1903 ka whakaae a Mahuta ki tā Te Hētana, arā kia kuhu a ia hei mema o te Kaunihera Ture, hāunga ngā whakahē a ētahi tonu o tōna iwi. Ka tukua e ia te mana Kīngi ki tana teina ki a Te Wherowhero Tāwhiao mō tētahi wā. Taro ake, ka hōhā a Mahuta ki te mana kore o tana tūranga i roto i te Kaunihera Ture, ki ngā kaupapa here whenua Māori a te rōpū Rīpera. Roa te wā e tatari ana kia whakataungia te kerēme mō ō rātou whenua i raupatutia. I muri i te tau 1907, kāore i rongohia te reo o Mahuta i ngā tautohetohe, ahakoa te mea ka tae ia ki ngā noho tae atu ki te ekenga o tōna wā ki reira i te tau 1910. I taua wā ka hoki anō a Mahuta ki te whakahaere i ngā kaupapa a te Kīngitanga. Ka mate ia i te tau 1912. Poto noa te wā ka noho a Kīngi Mahuta ki te Kaunihera Ture. Me kī, kāore he painga i puta i tērā whakamātautau o te mahi tahi a te mana o te Kīngitanga me te mana o te Pākehā. We have 9 biographies, 3 articles, related to Mahuta Tāwhiao Pōtatau Te Wherowhero.